London Police Subdue Machete Weilding Man Without Killing Him. No One Injured. Homeowners called police after the balding man was spotted standing in the middle of a roundabout holding the lethal weapon. When officers rushed to the scene, witnessed said the man reappeared ‘out of nowhere’, waving the blade in the air. The video footage shows the man frenziedly staggering around the normally busy main road grasping the blade in his right hand. With two squad cars parked in the middle of the road to act as cover, police officers continue to scream at the attacker during the seven-minute video urging him to lay down his weapon. But ignoring their pleas, he strides around lashing out at anyone who dares step near him. He can be heard screaming ‘come on then’ before cornering one policeman behind a wheelie bin. 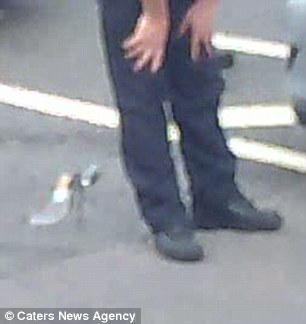 Acting instinctively a brave colleague dashes to hit the machete-wielding man with his baton – before being driven back as the man turns and lashes out. Officers wielding riot shields and batons can be seen slowly surrounding the man in a horse shoe shape – before rushing him and pushing him to the ground. 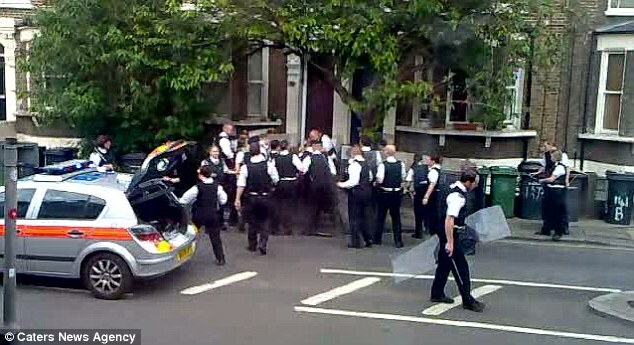 ‘We thought she was joking – but moments later a load of police cars came screaming around the corner looking for him. ‘We then heard this really loud high-pitched yelp and he just came out of nowhere. Eight of them quickly sprayed him in the face with CS spray – but he didn’t go down. ‘Even though he couldn’t see, he was still thrashing around swinging the machete at anyone who came near him. They tried to knock it out of his hand and one even tried to ram a bin in to him. The incident happened on Monday, a spokesman for Scotland Yard said. Mr Pether, 21, who attends Goldsmiths University, added: ‘By the end there was at least 35 police officers at the scene – it was mad. ‘They eventually got him to lay down his machete and then all the police just rushed him. They pushed him up against a lamppost and put him in a van. ‘I don’t know what made him take to the streets with a machete but he was clearly angry and upset about something. 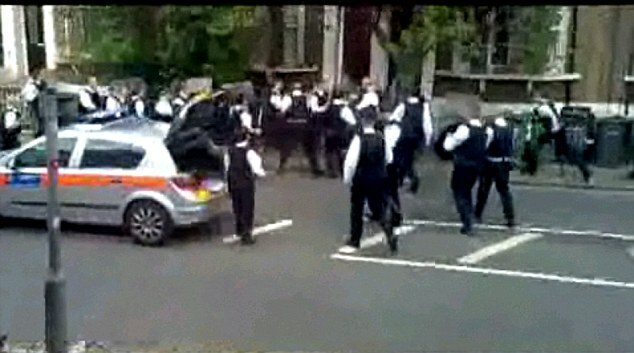 A Metropolitan police spokesman said: ‘Police were called to Shardelos Road, SE4 on Monday 16 May at approx 18.20hrs to reports of man in the street armed with a machete. ‘Officers attended the location where they found the man and called for the assistance of central units. ‘They managed to detain the male and disarm him – no officers or members of the public were injured. ← Homeless Man Holding a Stick Killed by LAPD.